What benefits have buyers seen when using this Ultrasport F-Bike? This folding feature and the small dimensions are indeed mentioned by a large number of the consumers currently responsible for the bike’s high satisfaction rating online. This aspect has actually been improved for this up-to-date mode, with the curved shape apparently allowing for a more compact shape, which shows that the manufacturers do understand the requirements of their audience. Another much loved addition to this Ultrasport F-Bike is the back rest, which makes the experience even more comfortable. 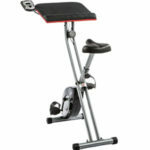 Moving away from the style and onto the performance, the promise is that buyers can tone their muscles and work on their cardiovascular system with ease and keep track of their progress via the console and pulse grips. The reality is that buyers can enjoy what has been been described light to moderate exercise at their own pace, and in relative peace. 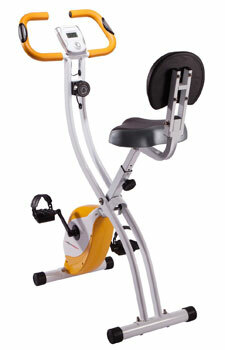 What disadvantages have been mentioned in reviews for this Ultrasport Exercise Bike F-Bike? First impressions from photographs of this bike lead to concerns about the sturdiness of the frame, as there is little too much weight or substance, and also the quality of the console as it looks pretty small. There may be some limitation to users in the fact that the maximum user weight is quite low at 100kg, which adds to queries about how much intensity this bike could handle, and while most within this range are happy, there are comments on little construction issues like small cracks to the plastic and knocking sounds when pedalling. In addition to being a little weaker than its competitors in its construction, there are some clear drawbacks in its abilities. Some users would prefer to see a few more resistance levels and there are some questions regarding the accuracy of the data. Summary: is this Foldable F-Bike still a highly recommendable purchase? 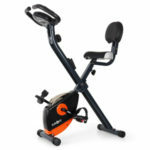 This is clearly one of those exercise bikes where they thought about the design and the unique features that make it stand out before they considered the performance and capabilities. 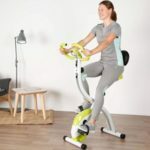 The target market for this product is the apartment dweller that needs a compact machine for a gentle cycle in the morning and would rather have a decent folding mechanism than an intelligent console or tough resistance system. 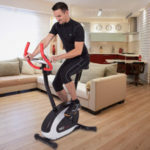 There are bikes that go further with their resistance, data displays and durability but the high number of happy buyers here shows that the Ultrasport exercise bike is still a great product because it fulfils its chosen aims so well – it may not be high-end but it is convenient, stylish and user-friendly. 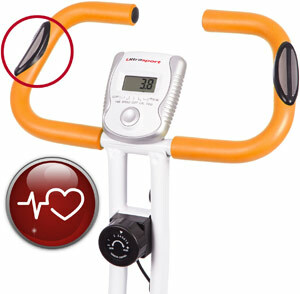 Find more reviews about the Ultrasport F-Bike Exercise Bike on Amazon here.